Jimmy Khan and his wife, Firuza Khan, were visiting from Mumbai in June 2007, and Jimmy, who met Meher Baba as a teenager, gave a talk at Meher Center in Myrtle Beach, SC, on the 30th, highlights of which are summarized here. Jimmy Khan estimates that he saw Baba between 150 and 200 times between 1961 and 1968 at Guruprasad in Pune, and only once at Baba’s residence in Meherazad. Jimmy’s family would come to Pune from Bombay to be with Baba, staying at Mobo’s Hotel (along with the Mistry family), which was in walking distance of Guruprasad. To clarify his descriptions, Jimmy described the layout of Guruprasad, which was a palatial building owned by Maharani Shantadevi and situated on the Bund Garden Road in Pune (formerly spelled Poona when India was under British rule). 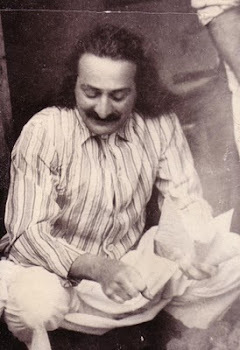 Meher Baba first stayed at Guruprasad as far back as 1951; later he began to stay there regularly during the summer season (roughly April-June; Baba said “In March we march to Poona), as a break from the intense heat in Meherabad. Jimmy describes Guruprasad as a hybrid between a bungalow and a mansion, as it was relatively small but highly ornate, with big iron gates at the roadside, a long, well-manicured garden and large fountain, marble statues, golden etching on the glass doors, and high ceilings with chandeliers. At the top of the marble steps, there was a broad verandah around the front and south side of the bungalow. A huge central doorway led to a spacious hall (or drawing room). During the weekends, when there was a kind of open house for Baba-lovers, 200 to 300 people would gather there before Baba seated on his sofa at the far end. The hall was flanked with three rooms on each side, containing the men and women mandali's quarters respectively. Baba's room was alongside the verandah on the women’s side. On the men’s side there was a big room (“mandali hall”) in which Baba would sit with his men mandali and people whom he invited to meet privately with him before the darshan program. In the afternoons, Baba would play cards in this room with the men mandali and invited lovers. Correspondence from all over the world was also read to Baba in this room. The room where the men stayed had a phone and served as an office where Eruch replied to English-language letters and telegrams from all over the world, while Bhau was in charge of Hindi correspondence. Just next to where Eruch sat was the pantry room where Pendu would store food that came from Edward Hotel for the mandali. Behind Guruprasad was another verandah, where Baba sat during the East-West Gathering of 1962 and the Eastern Sahavas of 1965. This “backyard” could hold up to 10,000 people. Jimmy’s father died in the late 1950s when Jimmy was nine. Their mother, Khorshed, was then forty years old, and overnight she became a single parent to Jimmy and his two younger sisters. Into her grief-stricken existence came Roda Mistry, who was Arnavaz Dadachanji’s sister (Roda passed away in 2006). Roda would come to the Khan family home once or twice a week and talk nonstop about Meher Baba. Roda also introduced Jimmy’s mother to Hoshang Patel, who spoke to her about Baba as well. Khorshed Khan was very ripe to receive spiritual ideas, and she accepted Baba wholeheartedly even before meeting him. She would close her eyes to meditate and would see Baba before her. In 1961, Roda announced that she and her family would be going to Pune for two months to see Baba at Guruprasad. She suggested that the Khans come along and stay at Mobo’s Hotel, and maybe they could see Baba too. And so they did. Jimmy was seventeen at the time. Roda was quite absent-minded. When she saw Baba, he asked her whether anyone had come with her from Bombay. She said, “Yes, Baba, my family.” “Anyone else?” “No, Baba.” “What about the lady at the gate?” Then Roda remembered. “Yes, Baba, Khorshed Khan has come with her three children.” Baba said to bring them the next day. The next day Khorshed came to Guruprasad with a garland for Baba. When she saw the crowd on the verandah, she was disappointed, as she had hoped for a one-on-one meeting with Baba. Just then someone announced that first-timers could come to meet Baba first, and the others would come afterward. So Khorshed felt that Baba had heard her prayer. Roda brought the Khans into the room, and Khorshed fell into his arms, releasing her pent-up emotions. She sobbed and cried for five to ten long minutes while Baba held her. He told her, “My nazar [protective glance of the Master] is on your children; you don’t have to worry about them.” And from that moment on, while caring for her children, Khorshed became emotionally resigned to Baba, knowing that he would look after them. Baba had Dr. Goher come in and examine the two sisters; she said they were skinny but fine, there was nothing to worry about. As a teenager, Jimmy said, he was not mature enough to be hungry for Baba’s love and had not yet accepted him as the God-Man. Yet through meeting Baba many times, he grew to love him quickly. Mobo’s Hotel would be booked up almost entirely with Baba-lovers during the summer. All would troop to Guruprasad, which was a short walking distance away. People did not bother to wait for family members but would walk over when they were ready. Since the room in which they gathered was small, holding no more than twenty-five to thirty people, Jimmy was never sitting very far from Baba—sometimes as close as eight feet from Baba’s chair. The men mandali were there but not the ladies. Baba would begin by asking questions to put people at their ease: Did you sleep well? Did you eat? After a few pleasantries and some laughter, they settled down. Eruch, who, as noted, attended to Baba’s English-language correspondence, one time brought to Baba a letter from Jimmy in which he stated that he would like to become a pilot. The other men who were present when the letter was read out—whom Jimmy described as the “heavyweights,” such as Nariman Dadachanji, Dr. Deshmukh, and Meherji Karkaria—all offered their opinions. Some said it was too risky and that Baba should not encourage Jimmy. Others said no, it’s fine, planes are safe nowadays, everyone is flying. Jimmy’s mother of course turned to Baba for the decision, but Baba didn’t say a definite yes or no, he simply pointed out that a pilot needed to have strength, and Jimmy was very thin. At the time, Jimmy was in college studying for a B. Comm. (business) degree, in preparation to become a CA (what Americans call a CPA). Baba pointed out that in an accountant’s position Jimmy would “sit in a big chair,” people would respect him, and he would make good money. On weekends, darshan would be given in the central hall, and qawwali programs were given in the afternoon. Baba was very animated, every minute gesturing in a lively manner, keenly listening to the ghazals. These were in a mixture of Hindi and Arabic, and every few lines Baba would stop the singer and explain in gestures the central theme of the couplet; otherwise the audience would not have been able to follow. Often he would continue with a discourse related to the ghazal. Also during Indian dance (kathakali) performances — presented before Baba by little girls in costumes — Baba would interact constantly, gesturing in synch with the singers. The last song was always “Gate Chelo,” which means “Sing His praises and move on.” But who would want to move on and leave Baba for the afternoon? Only once in his life did Jimmy have the rare experience of seeing Baba three times in one day. He and Meherwan Mistery were called to Baba’s room, where he sat on a cot in his shorts and sadra. Baba, who had broken both hips in his accident, was in great pain, and Dr. Goher was giving him a light massage. Roda and Adi Dubash’s son, Meherwan, was reading the newspaper headlines to Baba. He’d read a couple of paragraphs of the news item and then Baba would tell him to go on to the next headline. The last page was sports, which interested Baba very much, so this was read at length. Elcha Mistry and Baba’s brother Jal were taking turns telling jokes to Baba. Elcha, with his long Parsi nose, was so comical that Baba had to clap his hand over his mouth to prevent the premature breaking of his silence. Baba thoroughly enjoyed these two clowns. One time Jimmy’s mother was walking from the hotel to Guruprasad and saw a vendor selling pink and white garlands made not to real flowers but of cotton. No real flowers were available, and she wondered whether she should get a cloth garland for Baba; would it look OK? She decided it wouldn’t look nice and passed the vendor by. Inside Guruprasad, Baba was seated in a chair — without any garlands on. He gestured, “No one bought a garland for me? Not one?” On a hook was an old cloth garland whose pink flowers had faded white, and since no one had brought any, Baba garlanded himself with this old garland. Jimmy’s mother felt so sorry that she hadn’t bought the garland — that she had allowed her mind to overtake her heart. Baba, of course, has often said that he has not come to be garlanded; what he wants is our love, nothing else. Indeed, at many of the mass darshan programs recorded on film, we can see how the numerous garlands are a burden to Baba in the heat, Eruch having to remove them, wipe Baba’s perspiring neck with a handkerchief, and put the garlands aside to make room for more. So this occurrence seemed like a message designed to show Khorshed Khan not to allow her mind to overtake her heart. There had to be an even number of players sitting in a circle, typically from 20 to 40, sometimes fewer. If an odd number of men were present, one of the mandali would stand out. Every alternate person would be on Baba’s team. Sometimes Jimmy was on Baba’s right and Jim Mistry on his left. Jimmy would shuffle. One joker was removed from the deck. The other joker was the highest card; next best was the ace of spades. If there were 24 players, they were given 2 cards each; if fewer, then 3 cards each; the rest of the cards were put on the carpet. If Baba received very low cards, Jimmy would have to shuffle and deal again. 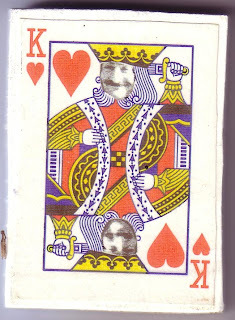 Baba had to have “nice cards.” He would ask who had the joker, the ace, jack, or king, and they would openly discuss it. He might even peek at the other team’s hands. If the opposing team had the high card, he’d tell them, “Give it to me,” and all of a sudden the game was over before the cards had barely been dealt. Yes, Baba as the Divine Sportsman would cheat, but others were expected to play fair. The losing team had to rub their nose on the carpet while the winning team cheered. (Baba never rubbed his nose on the ground.) Once a guy refused to rub his nose, and the Twins (Baba’s nephews Rustom and Sohrab) forced him, while Baba silently shook with laughter. There were spiritual overtones to this gesture of humiliation in the presence of the God-Man, suggesting that one was rubbing away one’s sanskaras. It was therefore regarded as a privilege by the men. I’m reminded of the story of Rumi losing a chess game to his Master, Shams, who told him, “No, you have won!” because in that moment he granted Realization to Rumi. In fact, sometimes while playing cards, if a conventional-minded religious person arrived to see Baba, Baba would gesture to the mandali, “Quick, sit on the cards!” so that the visitor would not be shocked. This was not hypocrisy on Baba’s part but rather, out of his divine courtesy, meeting their expectation of how God was expected to behave. As soon as the visitor was gone, out would come the cards again. As Jimmy Khan described it, while playing La Risque one’s mind was focused on the cards, lost to the world and all worries. With your energies focused on the cards and the desire to win, Baba would use those energies to work on you. A similar event occurred when Baba attended movies. While the spectators’ minds were focused on the film, they forgot their problems, their families, their bodies, and under these conditions Baba could work on them. Baba attended the show only to do his work, and when that was done, he was ready to leave, often to the mandali’s disappointment, as they would have liked to know how the movie ended. Again, at cricket matches, where there would be thousands in the stadium, Baba would go for his work and then leave; he wouldn’t sit for one more ball, even though Baba loved cricket and had played it himself as a youth. 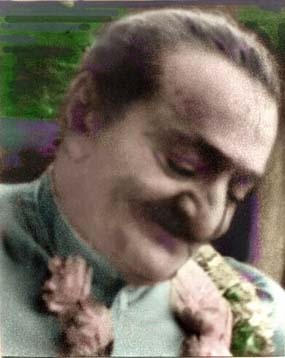 In response to a question from the audience, Jimmy said that the conviction that Meher Baba was the Avatar of the Age was not of concern to him. Just being in Baba’s company was all they ever wanted. We have heard similar remarks from many other Indian Baba-lovers whose families were in close contact with Meher Baba. Through such stories of experiences in Baba’s presence, one sees how Baba lived and imparted his love most naturally among people as one of them, and one with them; however, he would frequently remind them: Never forget that I am God. I really enjoyed reading this account. It made me feel as if I were actually there, witnessing the intimate, day-to-day events of Baba and His close ones. Thanks!